When it debuted in 2003, Top Thrill Dragster was the top dog—the fastest and tallest roller coaster in the world. The similar Kingda Ka at Six Flags Great Adventure has since eclipsed it in height and speed, although not by much. Like all rocket coasters, Top Thrill Dragster is all about the hang-on-for-your-dear-life launch. With its insane acceleration, speed, height, and drop, Top Thrill Dragster is the epitome of a thrilling ride. Cedar Point knows roller coasters. The popular Ohio park is loaded with them. But Top Thrill Dragster is a different breed of thrill machine. Like some mutant monster that emerged from a pile of radioactive goo, it sits smack dab in the middle of the park's midway looking impossibly tall and menacing. There is no slow click-clack-click ascent up a lift hill; no teetering-at-the-top followed by a cathartic first drop; no inversions. It's just an unholy 120-mph launch up, over, and down an insane 420-foot tower. The coaster sports a drag racing theme. The ride ops are dressed like a pit crew, and there are checkered flags everywhere. Sitting in the loading station, the anticipation builds for riders as trains stacked in front of them depart. When they reach the front of the line, huge racing car starting lights along the straightaway and on the tower itself signal the launch by changing color from red to yellow to green. As with most launched coasters, the brakes release just before Top Thrill Dragster takes off and leave the train momentarily free-floating in neutral. In that split second before Top Thrill Dragster blasts off, you may see your life flash before your eyes. Then, an explosion of force will rip you from your life review as the coaster will send you hurtling straight ahead at 120 freakin' miles per hour. It's all a blur. A mind-blowing blur. The train barrels down the track, shoots 90 degrees straight up the tower, slows as it reaches the 420-foot apex, and then dives head-first 90 degrees straight down the other side. A 270-degree spiral on the descent adds a bit to the sensory overload. Before you could process what happened, the train will race for the "finish line" and slow as it approaches the station. You'll likely be shaking, rattled, and weak-kneed, yet elated. Top Thrill Dragster confers a dragon-slaying sense of accomplishment onto riders that few coasters can match. 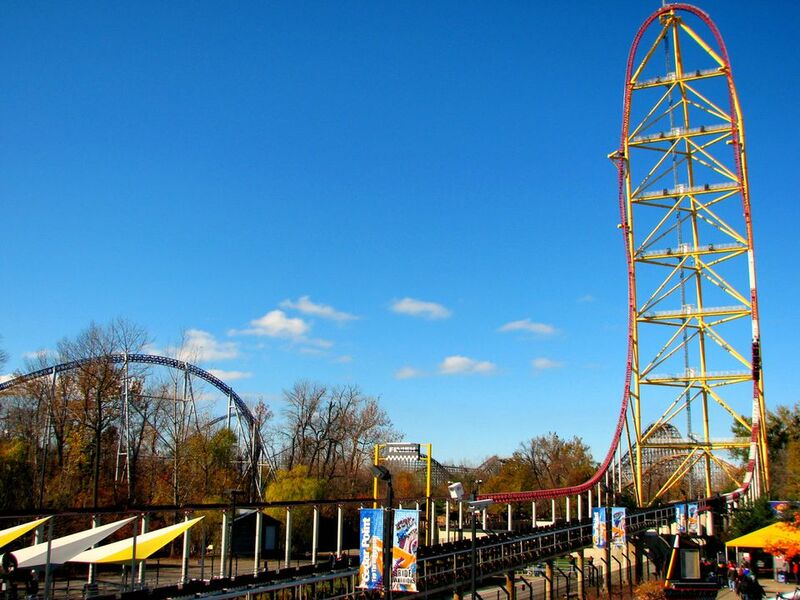 Unlike Kingda Ka, which is located in a corner of Six Flags Great Adventure and is only accessible via its loading station, Top Thrill Dragster's center-stage spot at Cedar Point grants parkgoers many vantage points from which to view the monster. It's a hoot to stand on the midway and watch riders' faces change from nervous smiles to sheer terror as the trains launch. While the rides are essentially the same, Top Thrill Dragster is marginally better than Kingda Ka. In addition to its more remote location in the park, the Six Flags coaster adds a 129-foot airtime hill after the top-hat tower that is lame, anticlimactic, and detracts from the ride. It seems that tower coasters work best when they concentrate on the tower. While the New Jersey ride is a bit taller and faster, I defy anybody to notice the difference. Top Thrill Dragster is an incredible ride and should be experienced for its sheer speed, height, and acceleration (by those brave enough to withstand its onslaught). But it is really a single-note blast of speed metal. More nuanced rides, such as many hypercoasters, are arguably better overall. Still, the Cedar Point ride easily makes it onto the list for the scariest coasters. Although Steel Vengeance, which opened in 2018 at Cedar Point, isn't nearly as tall or fast as Top Thrill Dragster, it is, by our estimation, a far better ride. Billed as the world's first wooden hypercoaster, it is a hybrid wooden-steel ride that melds a steel track onto the modified wooden structure of the coaster that used to be known as Mean Streak. It is a nonstop hoot of a ride that is loaded with airtime.